This is the transcript of a facebook thread following BESCOM posting their financial statement online. They invited comments and some questions were asked by me and others which I am selectively reproducing here for all to read, with credits. My objective at posting it here is to archive elements of the conversation and hopefully, spur some constructive discussion on the topic here on praja. See full facebook discussion here. I wish to place on record my appreciation to BESCOM for fostering this open discussion. See the BESCOM financial statement here. PM: Yes, the main reason for sharing the info was to make it transparent, and get the advantage of opinion and suggestions from public. Would have posted even if it had been a loss! We will be posting other info also, like the quantum of power purchased, sold, loss etc. Gmaccounts Tariff: please post all financial details, including the cash flow statements. SV: Do you benchmark with other ESCOMs nationwide on financial performance (and technical , operational parameters for that matter)? PM: It will be so good if we can do that! But, we hardly get time for all that amidst of the fire-fighting we do on daily basis! Come and be our guest for a couple of days! You will be amazed! NM: Philosophy of public undertakings is not to make profit but provide services of good quality, necessarily they incur loss which has to be made good by Govt. which once again is pulic money colected in the form of taxes. SB (GM F&T): Philosophy of public undertaking has undergone seesaw effect in changed scenario of of LPG environment, though the Service motto is ultimatum for BESCOM , financial viability also important for endurance of any company. We have to thank our MD sir, a true leader who is instrumental in shaping the company better and better in all area, either it be opening a counter for collection in rural area or its other end of activity i.e financial accounting. In between this two parameters there are numerous paradox has to be crossed to make the end a more satisfactory to all concerned . Thanks for overwhelming feedback/comments on financial statement of the company, we the compilers of the same feel elated because our effort for last three months with our 46 Accounts units, CMS section, Power Purchase section Company Secretary office & Statutory Auditors has shown the opening in FB and BESCOM financials to the world with so much further more to learn and unlearn. SV and responses from SB (GM F&T) interleaved : Okay, I read through the statement and there are many questions. What is the financial structure of BESCOM? Is it completely 100% stand-alone from the state budget. What constitutes long term liabilities at 2110 crores? Does future pension obligations come under long term liabilities? How is the pension funded? Trade payables at 2145 crores is bills payable? That is some 66% of your net tangible assets. Isn't that a large number? Trade receivables is 3752 crores. What does this consist of? It is amount to be collected from various category of consumers including Government receivable, inter escom receivables etc. Equity and liabilites is matching up with assets down to the rupee. Hard to believe. Is this some kind of accounting practice? So the assumption is that all asset values are un-depreciated? And sufficient provision is made as reserve for B&D in current assets. Where does salaries and capital expendire come in expenses? Currently revenue is some 1000 crores more than power ourchase expenditure. There is a prior period expense and an Extraordinary item that is pushing the profit after depreciation and taxes to 144 crores. What are these items? Prior period expenses /income arises due to various reason, mainly due to rate/unit for purchase of power is approved by competent authorities in the subsequent years and suitable treatment has to be accorded in accordance with event of happening. In may be higher or lower hence debit or credit in the accounts in the year of accounting . Extraordinary item is the amount released by Government as subsidy/Grant as compensation to Escoms for various reasons and events. It is of special nature arising out of some occasions. Not a regular kind and treated as income in the year of release. SV: This part is very concerning. Please see trade receivables of 3752 crores. Sri Suresh Bala expanded on it as "It is amount to be collected from various category of consumers including Government receivable, inter escom receivables etc". Now, from the statement, your average monthly operational revenue is about 784 crores. So, this pending amount is about 4.78 months worth of revenue. Isn't that crazy?!! As an average consumer, if I don't pay my bill, my connection will be cut by the 22nd or so (or I will see a sticker on my door according to the new policy). How can there be so much receivables? Can you segment this amount by which are the top 5 categories of consumers or others who owe money out of this 3752 crores? SV: I understand what you are saying sir at a high level, even without attending ORM meetings. Maybe the meetings will give detailed insight, but I am not sure how many more meetings I should add to my life ;-). Here is how I see it... ESCOMs were carved out of erstwhile State Boards in order to have a better situation in the power sector. The erstwhile state boards were all mired in debt (and still are in states where reforms are not implemented, correct?). Now we have a situation where the ESCOMs are not able to recover their dues in time due to flawed policies. What has really changed then? Is the ESCOM functioning like a company. if you categorize these dues as NPAs, would you have a profit at all or show a huge loss? These are rhetorical questions. The situation is the result of policy decisions made by the state. Here is what I hope to see in BESCOM (or any ESCOM's) functioning. BESCOM makes enough "profit" to cover -power purchase costs, salaries and other statutory obligations, depreciation on equipment and funds for future capital investments. That would be you self sustaining enterprise. Please don't get me wrong. I have sympathies for people at the low end of the financial spectrum. Farmers (at least some of them) get a very raw deal. But free power is an invitation to abuse. BWSSB water rates need to be adjusted to pay for the cost of power. And people who do not pay should face the consequences. If not, they will simply not pay. WHy should they, there is no incentive to. It is possible to frame policies to balance this better than the way it is being done now. Don't you agree? Sir, if things go this way, eventually, the tax payer will have ti bail out BESCOM and other ESCOMs. Not only that, in the current situation where there is a cash flow problem, BESCOM is incentivised to cut corners or "manage" Overall, this hurts the health of the electricity sector in the state and country. PM: What you say makes sense. I agree with you. I want such debates to happen. It will lead to better policies. What part of trade receivables are older by an year ? Some day as talks break down or we just dont receive some part of amount among trade receivables. Is there a way to transfer this burden by adjusting these figures in PCKL books. But i believe book adjustments only transfer these figures to books in some other office so the scenario wont change. • Dues from consumer is treated as bad debts after following a set procedure as per the regulations. Defaulting consumers are served with notice for clearance of outstanding arrears, failing which their supply agreement is terminated followed by issue of Forms prescribed (A,B & C) and recovery process is initiated through Revenue authorities as arrears of land revenue. Write-off process will begin in case the same cannot be recovered. • UDD and Municipalities pay electricity bills as per allocation of funds by the government which is less than our demand which is cause for the accumulation of arrears. • The interest is charged as per Condition of Supply , once agreement is terminated and process of recovery starts through Revenue authorities, charging of interest is stopped. • These kind of burden cannot be transferred to PCKL books, as it is a separate independent statutory body formed for monitoring of energy procurement activity. SB (GM F&T): In lighter vain , Can we conclude providing power to Street Lights, Water Supply and Ip sets as “Corporate Social Responsibilities? “ . Yes or no it is a Social obligation , all corporations (Escoms)s are leading obligators of CSR of this kind, but at what cost ? will there be a end of it or should there be a end of it. How to end this. Once when the floods wiped out Mumbai transformers manned by Pvt service provider due to heavy rains, service provider made a delay tactics compelling the state government to come to rescue as social obligation with no alternative, even statutory terms will not help in such situations. May be Government should device a mechanism where it should tie up with financial institution to pay the electricity charges on behalf of UDD/TMC/CMS/TP/VP in full and accept the obligation of fulfillment of amount paid . By this it may avoid Escoms pleading with financial institutions for funds for running day to day affair because of non payment of those categories. If collection from Domestic category and UDDs (street lights & Water supply) is recovered in full in respective months, escoms financial flow will improve to great level . SV: @SB. As a citizen and tax payer, I view this "CSR" as abhorrent. This is an example of spreading the rot around and really comes as a result of political pandering to the electorate as well as inaction. If you hold the line and say firmly that bill has to be paid, it will. Giving something free is also a recipe for misuse, a well established fact. Take the example of IP sets and street lighting. 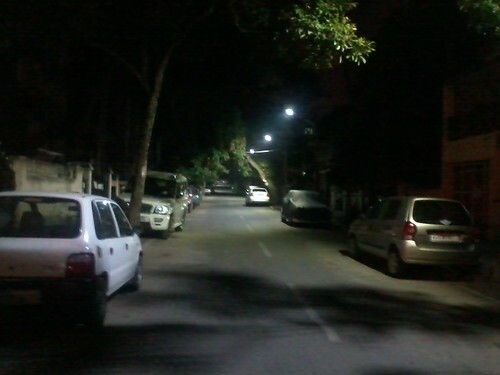 Have you seen narrow 20 feet roads with a blazing sodium vapor lamp in Bangalore. If you talk to our corporator and ask for street lighting. His immediate response is - how many do you want? 10? 20? I will have it put! That is because there is no cost or even a model to account for these costs. What do I mean by spreading the rot? Local bodies as the third arm of the government with financial autonomy has been clearly brought out in the 74th amendment to the constitution. 20 years later, it is still not implemented. When all accounts are finally tied to the consolidated fund of the state or state budget and the institutions are firmly within state control, fudging happens and the sickness of one organization infects the other. Take BWSSB. The estimate is that it costs more than Rs 24 per kiloliter to get Cauvery water to Bangalore. Most domestic installations pay about Rs 8 per kL on average. How will BWSSB ever pay your power bills? Additional irony is that there is enormous losses in BWSSB lines and 45% of the water is UFW (leaks and theft). Further, the people who get insufficient supply buy bad quality tanker water at Rs 60 per kL. Some very poor who get water in pots are known to pay equivalent of Rs 300 per kL. You think these very poor will not be willing to pay Rs 24 per kL if you give them metered water supply? People have even published well thought out models with slabs arranged so that the poor families can get water cheaper and middle class families pay higher cost of water to keep BWSSB solvent and functioning. But there is no political will to implement for many reasons. Net result - this situation also hurts BESCOM! This is a political problem. What I would expect of the BESCOM and BWSSB is to speak out loud about it and let the citizens understand the implications. Propose solutions, spur debate. The citizens will have to pressure their politicians because long term, they will pay the price for this. You have taken the first step and put your financial statement on facebook. Next step is to make a brutal assessment on recoverable debts and highlight the losses. Then put out the statement showing the losses due to unrecoverable dues. Send out a press release when the fin statement is out. Let the people know how things are and why it is so. PM: @SV I cant agree with you more! PM: @SV: I agree with you. Will be glad if we have experts to work along with us to submit such a request to the government. SV: Unfortunately, I have no expertise in such policy matters. Criticizing is one thing. Even stating a high level wish list is easy. Nitty gritty of policy is best done by an expert who has studied how various incentives work. I can always throw in ideas, but it will be more of the so called "intelligent analysis" variety with no data to back up any approach. Maybe SP is among this policy expert category? Sorry for the longish post. I just wanted to dump it all in an archivable location. The part that intrigued me is - what is a method to handle the "unrecoverable: public sector dues from BESCOM. The fundamentals of the solution are known. Does anybody have inputs on a creative approach? What will BESCOM do if a private person like me fails to clear my dues? Disconnect right ? As far as BESCOM is concerned why there should be any distinction. Public sector too should pay their electricity bills on time. @ Sanjay - excellent going. And, hat's off once again to Manivannan and team for this open debate. Why don't we get similar data from TPDDL (Tata Power Delhi Distribution Ltd), particularly dues from government agencies/ organisations, and make comparisons? I think I can manage to get TPDDL to give the figures. @Murali, I am fine with comparing with TPDDL if you can get data. Besides that, one area I was hoping to get some discussion going is whether there is a solution to this govt dues problem within the current framework? Even if you privatise distribution, this aspect is going to continue unless there is a fundamental shift. I am certain you'll notice the fundamental shift, and that's why I keep harping on privatisation as the only way out. Check out for yourself - I'll put you onto the TPDDL engineers. I am only interested in other discussions here. (A.) How to handle this problem of unrecoverable government dues - which is a problem whether we have private or public distribution companies. Long term reforms are well known. How do we get there? Is there an intermediate solution? (B) Any other aspect related to BESCOM financials that is not covered. We can cut the power anyday to BWSSDB. But then its the public who won't get water, and it may lead to untold inconvenicne and chaos, and even law & order at times. Same with BBMP street lights. Else why won't we do that? I am anyway putting presssure on them. Putting in FB is one way. The state is already conducting discussions with all of us. It may soon come with a solution. Makes good reading - great critical anaysis of BESCOM financials, thanks. Also, agree with Manivannan sir in that power to certain utilities cannot be cut off because these utilities face financial issues & are themselves unable to recover full costs. So, this pending amount is about 4.78 months worth of revenue. Isn't that crazy? If you are saying that's crazy, see what KPCL (the government generation company, whose only customers are KPTCL and the DISCOMS, again all government-owned)'s debtor-days are, resulting out of the cascading effect of delayed collections by BESCOM, and the other DISCOMS. It is a colossal 402 - meaning, for the Rs 417 cr that it billed on an average every month (09-10 figures), it is paid in 402 days, ie almost 13 and a half months later, the best debtor being BESCOM paying in almost 4 months, and the worst being GESCOM paying in 20 odd months. The gross debtor-days figure worsened from 295 in 07-08, to 339 in 08-09, to 402 in 09-10. For the full details of what I had collected through a RTI query, click here. Can I then be blamed for adding the comment there as "I wonder if there's any other 'business' in this world which will have any where comparable figures. My Socialist friends may want to say that this is not a business; it's a service. Well, then, please declare it as such"? @ Sanjay - I like to store all my ammunition in one place, and there is enough of it there. So, if at all I bring up any talk of 'privatisation' here, you may rest assured that the details on the same will be made available through a link to the debate elsewhere. Having said that, the point I was making was that the lack of financial discipline, particularly in the matter of collection of dues (mostly from other government organisations/ agencies) is the single biggest reason for their inability to function as a professional set up. If this matter can be taken care of, a BESCOM under a Manivannan will be able to outdo even a TATA or Reliance company. A second factor is that there are not enough Manivannans around, and by the time they establish themselves, it is time to move to Animal husbandry, or Sericulture. The question then is will the successor carry on the good work started by the predecessor? The Hindu recently quoted some BMTC managers talking about certain questionable pracices that crept in following the exit of Mr Upendra Tripathy. Anyway, let us confine the discussions here just to financials, though, in the process if some glaring inequities show up, it will be difficult not to comment on them, I guess. Remember, BBMP had started a initiative to go to all the houses, where owners have not paid property taxes with all the drums and all, and beat the drums all around their house, and let their neighbours know about it, so that humiliated owners pay the due property tax. When the defaulters are other public authorities like - BWSSB, Police Dept, may be a few policitians, ex ministers's upaid dues etc etc. Why not publish the list of all the defaulters like above departments, specific ministers or ex-ministers, MLA's etc, so that people get to know how are their representatives, law-makers and other dept officers who are there for citizen's benefit are not paying their dues. I second the point Murali is making. If you look at BESCOM's financial statement, the payables is not far behind the receivables. The problem will amplify up the chain, naturally, and as I stated in the transcript, the virus spreads and corners are cut and we suffer eventually. 1. As the MD, he is responsible to the "shareholders" of BESCOM - who are they? We the people? So besides this post on facebook, I would like to see some interviews, press releases and statements that clearly highlight this balance of receivables and payables problem. He should be screaming from the rooftops saying that the situation is hurting the entire power sector. Mr. Manivannan is MD BESCOM and on the board of directors of KTPCL. Here is the financial statement of KPCL. Looking at this, where do they bring out the BoP situation Murali talks about? I believe Murali, so KPCL is not disclosing the full facts here. 2. Part of the problem is Mani is also an IAS officer. He is responsible for BESCOM today, but he has to keep the bigger picture in mind. Tomorrow, he may find himself as chairman BWSSB, if fate conspires! That limits his ability to be forceful, thougn he is doing a great job given the circumstances. 3. This government is not able to take a decision on shifting an Amebdkar statue. You expect the talks by BESCOM to have any outcome? I have very low expectations. But this rot is enormously hurtful to the city, state and country. 1. So some things that have to be done are - Forcefully bring this debate to public domain. Posting on facebook is a great first step, but not forceful enough. 2. Classify the problem and start offering solutions. a. Farm subsidies have to be prepaid. How about the government give prepaid meters to the farmers and charge them directly. Insulate BESCOM and other DISCOMs from this problem. Other alternative is that payment be given aprori, as part of state budget. BESCOM to start billing or cut power once the money runs out. b. Utilities like BWSSB and the police. The BWSSB rates have to be reformed to collect the dues. There is enough material out there dexcribing how it can be done. Police - Can we make a rule that all police fine revenue first goes to the DISCOM? Is the state underfunding the police in its budget if their power bills cannot be paid? c. All govt offices (at least state govt offices in the BESCOM area - Maybe give them a lo0nger rope and then CUT power. BESCOM is nominally a company independent of the state. Here is an example. Infosys hires several ten thousand employees in this city. It also has the contract for income tax processing. If Infosys were not pay its power bill, would BESCOM not cut power saying "people would lose their jobs and vital tax processing work would stop?" Of course not. As a large customer, maybe they will get a longer rope, but eventually, the rope will run out. This will only have to be done once after which payments will start moving. Money has a time value which just is not appreciated in the government. BESCOM does not live on government dole. Private contractors of BESCOM do not live on air, but rely on timely payments to run their businesses. KPCL relies on payments to purchase fuel and do maintenance. d. Part of the problem is that even though BESCOM is supposedly a company and there are no provisions in the state budget for it, BESCOM is finally a govt enterprise. It is a thrishanku swarga. e. Rural areas... I do not understand the model to comment. I am happy and welcome such discussion! The idea of posting it in Facebook is exactly this! And, i am more happy with critical comments on BESCOM, including me! :) Because, unless mistakes are pointed out, one cannot improve! who made these rules? The democratic government, i.e, the people! You! This is undisputed - an example is the recent resistance to allow FDI in retail or the diesel price or gas price hikes to limit subsidies. Where's all the ammunition coming from for the likes of Mamata Banerjee & BJP to castigate the ruling govt ? How is it that they have such loud voices in public, though anyone can see that the ruling govt's moves are in line with what the country needs ? It's clout stems from peoples' resistance to pay correct value & demand free or subsidised services which they have been taking for granted for too long - even diesel car owners (whose numbers are now growing higher than petrol car owners) are up in arms, let alone the tempo /truck owners. Unless people by & large (not just well paid executives that read things here on praja) accept responsibilities & do not constantly badger the govt for subsidies & stop supporting protests at every step, nothing will change as opposition parties will continue their clamour against anything & everything that is conveniently seen by them as "anti-people" to go against the ruling party, economics be damned. As a result, we have a BESCOM that is unable to act on unpaid bills from BWSSB /BBMP, that are unable to realize water bills from other public sectors or property taxes from property owners, etc in a chain spiral whose end can never be identified. I agree with you that there are myriad rules and regulations which is effectively like a double edged sword and appreciate what you are doing.... very much. Two things I take from this discussion. BESCOM is still tightly bound by government rules. So even if it is a "company", it is not really so as the MD is bound up in archaic rules. 1. Can these rules be reformed without impacting transparency ? The MD should have more autonomy , if he or she cannot communicate directly with the public who own this company. You have any suggestions Mani sir? 2.Completely agree that the rules made by "We the People" is what is aggravating the situation. But I am ready for water rate increase. I pay 8 times the BWSSB water rates for non potable tanker water (I will not go into the corruption mela that is impacting water supply in my cauvery line). If BWSSB can give me better supply by rasing rates to even 2-3 times current rates, I will pay. They are also welcome to keep the lowest slab low to subsidize poor families. 3. The problem, Mani sir and Naveen is that our leaders are not leading. They have to understand and talk about the problems and find realistic solutions. It is a hard process, but that is the only way to make the tough decisions. Currently, all changes come down like a diktat from the heavens and the quality of the debates on TV and newspapers and in parliament makes one want to puke. For changes like that to happen, I firmly believe we need (i) The middle class to become active in politics - at least vote and (ii) New leaders. Agreed, but are we doing it ? In my society, everyone made a dash to get voters' ids when they were being distributed some time back, but when elections came, I & my wife were the only ones that actaully voted from our society, & I'm sure it's the same in almost all such communities. The voters' ids are "sought" by the middle & upper middles classes to gain access to subsidised services like gas, children's admission to govt subsidised quotas in professional courses, getting passports easily for overseas travel & for such purposes, nothing else. As for leaders, I think there are at least a few that have tried & are still trying - perhaps Manmohan singh is one & Jaiprakash Narayan may be another example. Most have given up or are forced to give up since they get mired in the vortex of petty politics -- again, largely a consequence of the people, & not necessarily because of poor leadership. Leaders are only a reflection of what we people are since they need to be elected periodically -- & we are forcing them to continue dishing out subsidies & 'accept' all kinds of mischief such as building violations, else they get voted out. "Leaders" & "Parties" have thus been reduced to dole out largesses to the poor who vote, make provocative & sweet sounding statements when hard decisions are taken by the ruling party, accept & condone the practise of subsidies demanded not just by the poor, but all classes, & this goes on without end. Well meaning bureaucrats, unfortunately, get side-lined in this tug of war. Others "make hay when the sun shines"! So am I, but will it change things if only a few of us agree ? Most, including middle classes will protest in the name of the poor -- like for the removal of diesel subsidy. I think this has a lot of merit. Suppose we do away with the term 'poor' & replace it with 'consumption slabs' - like power tariffs become higher with increasing consumption. Similarly, if the same were applied to just about everything -- like petrol to diesel to kerosene, water & all food items under PDS, etc, perhaps, it might actually work better than the present system of identifying BPL families & then issuing ration cards to them, resulting in many middle class families having multiple cards & in some cases, selling off the surpluses in the open market for profits. I know this thread is digressing, but I will make a short statement and stop on this topic. Unless the middle class shows interest in politics and voting, no change will happen. I agree with you that it is not happening much. What I am ssying that without it happening, do not expect the change that we all want to see. On water rates -> I think the government can sell it, but for that, they have to lead, hammer the message home over and over and set the slabs correctly. It has to go hand in hand with other reforms at BWSSB. I am sure a solution can be worked out which is much better and sustainable than what is happeniing presently. One should not ignore the least preferred option. Write off other dept dues as goodwill if GoK underwrites the same in the form of a grant to offset the loss. I cant imagine this being fiscally prudent in any way but practically this is what I think BESCOM ends up doing. If you are anyway going to write off get a grant in the bargain to offset the dues. @ Sanjay - There is another important aspect I overlooked mentioning earlier. Look here at how GoK is giving the royal treatment to the private sector player, Udupi Power Corpn Ltd, in the form of Power Purchase Agreements (PPAs) covered by a three-tier payment security consisting of Letter of Credit, Escrow and State Government guarantee, even as payments to its own KPCL need be paid when it suits the DISCOMS, which can extend to 402 days or more. KPCL is the state's main-stay; it has a fairly good track record, nurtured assiduously by the likes of Mr K Jairaj, when he was its MD. But, for all that, the government is giving it a raw deal, and, because of the raw deal, when it is unable to expand and meet the growing demand, the government now courts the private sector, accepting all their terms. KPCL is in deep trouble, and the funding agencies are probably not prepared to fund any more of their expansions. Leave alone expansions, going by some recent reports, they don't even have funds for day-today maintenance, because of which the units are even having to be shut down from time to time. This is also possibly why the GoK floated another company - KCPL - for the Bellary operations. It won't be far too long before that company also gets reduced to the same state. You don't want me to use the P - word, fine! But, isn't the writing on the wall all too clear? Madame Sheela Dikshit realised this long ago. And, that's why, very much like with Udupi Power Corpn, I expect (rather, I am sure) she has provided for making timely payments to TPDDL. Please do find out. In the meanwhile, can the citizens of Karnataka just stand-by and watch the slow death that KPCL is being put to? Aren't the imperatives I have been talking about fairly clear now? IDS, I agree that any write of has to be compensated by GoK as a one time grant. But what that means is that you and I and the other taxpayers got a hidden rate change in our electricity bill that is used to subsidize others? Let us call it akrama sakrama for the power sector eh? I was talking to an economist called Sharadini Rath (actually, if I remember correctly, she is a Physicist turned economist!) about BWSSB finances. Ms. Rath said something along the lines that government finances are an interconnected mess and that nothing is stand alone. I think the problem stems from Article 266(1) of the constitution (thank you google) which mandates the formation of a consolidated fund for each state. So basically, as far as all the inflows and outflows in the consolidated fund are balanced out, the state is fine. Would a law mandating that every state "cost center" close and balance out its budget at the end of the fiscal help matters? Let us say that I am BWSSB. At the end of the fiscal, I have to balance my revenue, expenditure, payables and dues and government grants and close the book. The current loose accounting may be hurting us here. @Murali... let us bring in privatisation in a limited manner here. If BESCOM were to be privatised, how would these payment problems get resolved? If you ask me, the only thing that changes is that the now the private company can make a lot more noise about this! Your thoughts? I was looking at Mani's statement that Rural and Panchayati raj dues are one of the major dues. Since my understanding of Panchayati raj in this state (or any other state) is close to zero, I went to the rdpr website. There, under the menu "Who is who, if you select gram panchayath, there is an option to drill down to each panchayath and see its fiscal situation (among other things). The direct link is through a gram panchayath portal - see here. I checked out couple of villages. I just randomly clicked on to Adagur village in Gubbi taluk of Tumkur Dist to check its balance sheet. You can too here. The quantum of data is interesting, no clue as to accuracy. Here is what I got. What I see is a Rs 1.77 crore deficit and street light receivables of Rs 691/- How does this business (panchayat) work? The story is the same for the few villages I looked up. Is there anybody who understands this better? ..or collect money in advance, like a prepaid card scheme. Dish out fancy power credits to all govt departments against payment. Dont wait for cheques to be cleared etc. get into some kind of electronic clearing arrangement. Not just in govt in private also there is scant regard for timely payments. We get in trouble in other countries because of this culture. The respect for timely payments is a culture & habit that needs to be formed, much like standing in queues. On thsi other comment of yours. Not just in govt in private also there is scant regard for timely payments. Agree, agree, agree. It is surprising to see the extent of the problem in the private sector as well. As rightly stated by Ms Sharadini Rath (quoted by Sanjay above), "government finances are an interconnected mess, nothing is stand alone". Couldn't agree with this more - unless cash collections, cash flows, expenses & accounts are fully streamlined + budgets in each & every dept balanced each year, nothing will change, & it may be futile to try to attempt the exercise for one dept such as BESCOM or KPCL. But this is a big ask when govts keep changing frequently & officials are shunted about every now & then. Further, there will be many depts that will keep seeing red year after year, especially KPCL, BBMP & BWSSB that have to keep pace with growth on one side & deal with subsidies & leakage of revenues on the other, & these are subject to political considerations. Another reason why subsidies are undesirable & at the root of all problems. Elimination of all unnecessary /inflated subsidies, beginning from national level down to the last panchayat might put these issues to rest for good. If BESCOM were to be privatised, how would these payment problems get resolved? If you ask me, the only thing that changes is that the now the private company can make a lot more noise about this! Your thoughts? If I understand correctly, SBICaps put through the Delhi privatisation package. There have been many learnings from the exercise, and, I expect, they will today be in a position to do the job much faster, and a lot more more equitably. But, it will essentially involve absorption of the accumulated losses by the government, and a proper tie-up for payment of dues on time, particularly from government agencies. Without such tie-ups, major players will refuse to touch a deal even with a barge-pole. But, it is not an easy process, and the more it is delayed, the more difficult it's going to become. Some comments on the Delhi exercise, when it was still to stabilise, may be accessed here. And, the comments, after stabilisation, specifically of the TATA operation, are accessible here. The imperative is of the distribution arm being under the private sector, since otherwise, the financial indiscipline starts there, and goes all the way up the chain. If that is taken care of, transmision and generation can continue even in the public sector, well, of course, as long as all the operations are regulated by a well constituted regulatory body. So much of praja analysis. Much ado [Bustle; fuss;] about nothing? Here is the problem Murali sir. a proper tie-up for payment of dues on time, particularly from government agencies. Without such tie-ups, major players will refuse to touch a deal even with a barge-pole. This proper tie up for payments is the weakest link. If you solve the payment issue, that takes away some of BESCOMs biggest problems, doesn't it? The belaku Yojana (changing incandescent bulb with efficient CFL for residential consumers) which could have saved karnataka DISCOMs huge amount (More than 1000 crores per year with their own estimate) was only carried out in two circles and has stalled due to lack of investor interest. The scheme is part of the Bachat Lamp Yojana from bureau of energy efficiency (BEE) where investors/Manufacturers will supply the CFL at Rs.15 to consumers and collect the rest of the money through carbon credits. But, due to crash in carbon credit prices (from Euro 12 to 3), it is not viable for the investors anymore. However, the DISCOM would realize huge benefits if they can invest instead of waiting for investors/manufacturers and complete the project. With their own estimate, the DISCOMS in Karnataka would save more than Rs.1000 crores per year with one time investment of just Rs.170 Crores. With the power situation in Karnataka, it is no brainer for DISCOMS to complete the project. 1. Direct saving through Tariff subsidy – the residential consumer in Karnataka pay at an average Rs.3 per unit and distribution cost is more than Rs.5. With one project (for a Division which saves around 60 GWH or 60 million units the saving is 12 Crores. 3. T & D Losses – the corresponding T& D losses for the peak load reduction which is more than 20% for BESCOM Saves lot of money. 4. Even though the carbon credit rates are low, DISCOM will still get some money back through sale of carbon credits. I have given this proposal to Mr. Manivannan but,it seems that he does not have authority to take decision on this most important project. Note: Kerala government invested Rs.95 Crores and completed the project in 2010 distributed 1.27 Crore CFL and have shown actual Savings of Rs.2200 Crores per year!!!!!. So Mr. Manivannan as Managing director of a Company, it is your responsibility to take the right decision and complete this project. @Ashfaq - can you give me the source for where this 2200 crore per year saving of the KSEB is cited? Ine thing I have noticed in Kerala is the repeated, high profile advertising (with top movie stars) for conservation with emphasis on the peak hour savings for the last couple of years. This included stuff like aking to turn off fridge for one hour per day during peak hours. So am a bit curious to see that source. I have the same question as sanjayv has asked. Can you show me the details of 2200cr savings in KSEB? 1. As investors are not ready, BESCOM has to invest. Which brand do we sell?! In a fierce competitive environment where the savings Vs cost is yet to be established, how do we go about it without entering inviting allegations of a scam?! 2. The disposal issues regarding CFL is yet to be settled. Indeed BEE, which spearheaded the project is keeping quite about this project. 3. LEDs are supposed to be more energy efficient. Do we go for that? which brand? Savings? Honestly I feel the street lighting consumes more power than all the individual households put together..hence fixing those will go a long way in controlling something which is easier..
Also, as I have said many times before, having vapour lamps everywhere for streetlighting, even in narrow streets, is the biggest mistake we have done! This proper tie up for payments is the weakest link. The answer to that lies in the difference in the funding arrangements between government-owned companies, and privately-owned companies. Do you think a private company would ever be operating with its debtors position anywhere close to those for KPCL, ie with working capital more than its annual turnover even? It's just out of the question. So, the private companies have either to make the necessary tie-ups, or just keep out of such businesses altogether. They have no choice. As compared to that, in the case of government companies, because of government guarantees, the funding agencies (largely government-owned, again) will generally refrain from applying the squeeze, and allow the show to carry on. The irregularities start perhaps in a small way. But, unless it is corrected immediately, it becomes a part of the culture, and then there is no turning back. Over the decades, this culture amongst the government-owned DISCOMS has affected the entire power sector chain, both upwards and downwards, and gone even beyond to coal, and railways, to name just a few. And, power sector being a key infrastructure sector, it has in turn affected the entire economy of the country, besides. It is not as if BESCOM doesn't have the authority to cut off supply to a BWSSB. But, if BESCOM starts acting tough, they will get called by the minister-in-charge, and asked to lay off. And, it is not just with one BWSSB; it's the same with all the government agencies, and even the road-side tamasha's during Rajyotsava, etc. This builds on, and eventually, it becomes pay when able, and that is how the culture sets in. And, as long these remain government organisations, the political interference is inevitable. A nephew of mine works for Reliance Power in Mumbai, and he can tell you quite a few stories of how they get their bills paid on time even by Dawwod's henchmen in Dharavi, or by Shiv Sena honchos. And, that is how much they value their money. The Karnataka government is now with its back to the wall. But, instead of applying the correction where it is needed most, ie distribution, it goes and makes a sweet-heart deal with Udupi Power Corpn, mucking up the environment in the bio-diversity rich coastal region in the process. If you scratch the surface there, you'll find enough cronies behind it. The savings in Kerala has been well documented and presented in a conference organized by BEE in New Delhi earlier this year. I have the presentation which is made by Mr. K.M. Unninathan Director of EMC Kerala who successfully executed the project. I have sent the presentation to Sanjay who would share it here soon. The power savings from incandescent to CFL is significant and price is affordable but, for additional 12 to 13 w reductions for using LED, the cost is very high. Off-course the life of LED is long but, initial cost is too high for a common man to digest. The disposal of CFL is an issue but, it is an issue for 250 Million CFLs currently being sold every year in India. It is possible to encourage proper disposal through the BESCOM unit offices. It has been suggested by BEE to have recycling bins outside BESCOM offices for the consumers to dispose CFL. Also, after the complete life of CFL, only negligible amount of mercury is left. Yes the savings shown is a best case scenario but, even with 50% success, the savings are significant. I am aware that there was no significant savings realized in the two circles where the project was done, but, it was for different reason. Besides, there is no data captured to show the before and after scenarios. Investment from DISCOM/GOK: The project would be same BEE Bachat Lamp Yojana, similar to kerala model where the government of Karnataka would extend loan/grant for implementation of the project and assign the implementation to nodal agency like (KREDL). The loan is paid back through the savings realized by the DISCOMS. The nodal agency will work with the CDM Consultant/Implementation agency and complete the project in each Division/Circle of the DISCOMs in the state. The loan/grant would be used for purchase of CFL through competitive bid. Rs.15 would be collected from consumers which would take care of distribution expenses, CDM expenses, ICL Destruction, monitoring survey, etc. There is Rs.3 Lakh given by BEE for awareness program per CDM Project (a CDM Project cover around 200,000 households). The BESCOM DSM campaign can be combined with this and make it an effective campaign and reduce the power consumption significantly. Also, every power policy draft of Karnataka Government from 2010 includes the implementation of Bachat lamp Yojana as the first step towards energy efficiency in DSM. So it is not new or outside BESCOM power policy. even though there may be better programs to save power, but, this is a established program which is being implemented in many parts of the country, which is easy to implement and provides significant savings. If you can initiate the process, I would be happy to come and do the presentation to the Power Secretary, MDs of all DISCOMs in the state and Power Ministry. According to various news sources, the center is considering a second round of reforms in the power sector. I have to say compared to certain states like Tamilnadu, BESCOM is a picture of financial health. The news items speculate on a lot of stuff like Bonds being issued and other financial mumbo jumbo that I did not quite follow (see here). The major sentence that caught my eye in the context of this discussions was the sentence which went " To avail of the scheme, a state government will have to fulfill certain mandatory conditions such as payment of pending bills and notification of tariff order for 2012-13 prior to availing of the scheme". So the state will have to seriously think of settling pending bills. I hope something does happen. However, all these forced measures are not a permanent measure unless the state gets its act together and imposes true financial accountability and costs on all its departments and mandates a much more autonomous position for BESCOM and other DISCOMs. The other alternative is privatisation, but I do not see the private sector touching this unless the same steps for fiscal discipline are taken. There are other concerns that I have about privatisation in this sector which we will save for another thread and another day, to keep this discussion on track. There are other concerns that I have about privatisation in this sector which we will save for another thread and another day, to keep this discussion on track. The plan, however, does not address long-term problems in the sector, analysts said. "The debt restructuring as it stands appears largely a breather as it is not accompanied by any concrete reform measures," Kameswara Rao, a partner at consultancy PricewaterhouseCoopers, said before the cabinet approval. Distribution companies, under political pressure to sell below cost and losing more than a quarter of their power supply to theft and decrepit networks, have been borrowing for years to fund their losses. Kuljit Singh, a partner at consultancy Ernst and Young, said the government should bring private players into power distribution, which would make the sector healthier in the long run. Thanks for the pre-emptive list Murali. I read through your link (actually have read it before) and actually agree with most of the points made there. My concerns are different from those. I do not want to articulate those points here to avoid derailing this thread. The cooperative model is also quite appealing. When I used to live in the US, several counties and towns had co-ops or city owned utilities. Since the budget had to be balanced at the end of the day, they all performed a pretty good job. Also agree with you that whatever is published on DISCOM rejig/reform/bailout does not seem to address many of the current problems. We cannot afford another bailout and then going back to status quo. Ashfaq Syed sent me the Kerala presentation. I will post it here after we secure permission from the author to do so. Almost all of the 2200 crore "savings" comes from "avoided" generation capacity by assuming a capital cost of 6 crore/MW, about 1200 USD/kW which is roughly the capital cost of a coal fired plant. BESCOM being a Discom that really does not do a whole lot of generation would not be enthused by such a model. "avoided cost" is not called "savings" its called "opportunity cost"
As shown in the presentation, normal power demand is about 1800 MW and during peak hour, it goes to 2800 MW. So the additional power purchased by paying money/cash to satisfy the 1000 mw power during peak period. the routine power requirement is through long term PPA signed but, the additional power requirement during peak hours is purchased in open market at premium (that is what the director told me). if the power requirement during peak hours is reduced using energy efficiency measures, the DISCOMS don't need to buy that much power at high cost. I would say that is big savings for DISCOM. Infrastructure was historically funded almost entirely by the government. Cost overruns were endemic, averaging a phenomenal 61% back in 1991. These were financed by grabbing more taxes from the public or by printing money. However, these options are not available to corporations. Infrastructure requires heavy loans, often twice as much as equity. Such loans have a fixed repayment schedule. If a project is completed on time, revenue from the project will finance the repayments. But if there are delays of months or years, the project is squeezed badly. It's even worse if projects are unable to operate (such as 30,000 MW of power projects stranded without fuel) or suffer from sudden changes in environmental regulations (as in Hindustan Construction's Lavasa township) or from outright cancellations (as in the scam-ridden 2G telecom case). For the full text of the blog by Mr S A Aiyer in the SToI, click here. By the way what are discoms? which sector is free of corruption? "In fact, the entire energy sector – ranging from oil to gas, coal and nuclear energy – is a minefield precisely because politicians have used it as a milch cow for bankrolling their re-election, not to speak of generating black wealth for themselves and their business cronies." I had asked this on Facebook but did not receive a reply, let me ask here too. 1) What is the average cost/unit that BESCOM pays to generators? 2) What is the average cost/unit that BESCOM charges to consumers? I am sorry i missed it. Please post it in FB and tag me. I will ensure you get the correct data as approved by the KERC. Passed by Masti Venkatesh Iyengar (my great grand uncle) road tonight on the way back home and was plesantly surprised seeing the entire street lit by LED lights..it was nice and bright..the one problem was it hurt seeing right into the lights..this road is parallel to bull temple road.. Right move in the right direction..should say! Pradeep Konapoor posted answers on Facebook. Sharing here with everyone. The stark reality is that due to the short-sightedness of our policymakers and the political class, we are unable to mobi-lise the national consensus needed to do away with subsidised power to the agricul-tural sector. The decision-makers fail to realise that more than subsidies, it is round-the-clock and quality power supply that holds the potential to completely transform life in rural India. It is worthwhile to mention here that agriculture, which accounts for over 25% of the electricity consumption, contributes to a mere 5% of the revenue. Inadequate tariffs on one hand and high technical and commercial losses on the other have completely destroyed the financial health of all state utilities. For the full text of an excellent article by Mr Lalit Jalan, CEO of Reliance Infrastructure Limited, in the ToI, click here. Almost a year after the Minister of State with independent charge for Power, Coal and New & Renewable Energy Mr. Piyush Goyal worked to solve the issue of coal block allocations and creating coal linkages to support long term fuel availability, the discoms have got their own revival program. Named UDAY or Ujwal Discom Assurance Yojana, the program was announced by Mr. Goyal on November 5th after a series of extensive consultations with state governments – Chief Ministers, Power Ministers, and various bureaucrats, to get them onboard with respect to this transformation plan. - - - UDAY is not a simple central government driven bailout program which just gives cash to discoms and states without accountability. There’s a specific roadmap for debt restructuring and there are hard budget constraints imposed for participating in the program. Once on board, the states will not be able to back out and the only prudent course of action for them will be to keep their side of the bargain – which is around driving operational efficiencies. - - - The states which opt for UDAY and improve on their operational parameters will be given increased grants via these two schemes to create a better state level infrastructure. The central government will take a discretionary call on budget allocations based on performance on UDAY parameters, thus creating a positive reinforcement loop – better infrastructure will further aid operational improvements. These schemes are investing in real, high impact areas like compulsory feeder and distribution transformer metering by states, separation of agricultural feeders, consumer indexing and GIS mapping of revenue losses. Each state stands to gain more if it does more from its own side. - - - Yes – the states can still mar the program. India is never too far from a populist electoral campaign promising free power to farmers, or parties asking consumers not to pay their electricity bills, or consumers tampering with electricity meters with no law and order control. But since 2013 December assembly elections, more and more election campaigns are moving towards a development and outcomes plank, rather than identity or inputs plank. Hopefully the democratic process will provide enough incentives for politicians to not wreck the boat. UDAY is a well thought out, scalable and future proof reform and restructuring program. It creates an actionable roadmap for each discom to become profitable over the next 5 years, while cushioning the financial pain by reducing cost of financing and cost of operations. The program puts in place the right incentives for state governments to act in good faith towards cooperating with the central government and jointly achieving the stated targets. Mr. Goyal has worked closely with all the states to get them onboard this program, and in the spirit of the country’s federal structure – providing fair terms and conditions in lieu of signed up improvements. For an 18 month old government, eager to demonstrate that its policy announcements can be translated to operational changes, UDAY comes in as a shot in the arm. Starting Q1 2016, there will be visible action every day, as discom loans get restructured and transferred and as states reach out in the market to sell their bonds, testing their credibility and putting their reputation on the line. For the full text of an analysis of the programme by Mr Aashish Chandorkar, a management consultant, in Swarajya magazine, click here. Looks good overall. The important question, as far as Karnataka government is concerened, is whether it wants to reform, or wreck the programme and carry on with the status quo, in order to perpetuate the vested interests of the ruling mafia confederation. And, as far as the people are concerened, it's time they declared intolerance to the present state of affairs (where they are worse off than the people of rural Bihar even - check this), and even went beyond and demanded that they get services comparable to the best in the world. I would still like to maintain that the best option for the state would be to go in for privatisation (of distribution) in cities, more or less on the Delhi model, and outsourcing through franchises in townships, and co-operatives in rural areas, as suggested here. The minister asserted that the government had taken all measures to provide power to the entire state in the coming months by purchasing power from central government (Rs 4.50 paise per unit), exchange and from other sources at Rs 5.80 per unit. The minister was addressing the media after a visit to the Sharavathi generating station on Friday afternoon along with Energy Department officials. Another major factor responsible for the turnaround is the ushering in of financial discipline amongst the stake-holders involved (more particularly the government), resulting out of the reversal of an earlier order by the Supreme Court, after the private players came into the picture, leading to smoother and timely cash flow between them. In contrast, the government-owned BESCOM (Bengaluru) and its sister ESCOMS put together are paying their main supplier, viz government-owned KPCL, in 402 days on an average (ie almost 13 and a half months later - 09-10 figures; they aren't any better even now). And, financial discipline was possible in Delhi only after the private players came into the picture, and therein lie the imperatives of pursuing that route - read more here. However, even with the lesson staring you in the face, the government refuses to look in that direction. Well, aren't the reasons obvious? Ideally to my mind, no state needs to increase tariffs. Personally I think with the 180000 cores saving that the state discoms and correspondingly the people of the states can enjoy because of successful implementation of UDAY can take care of the losses. In fact we should actually be seeing price reductions. And the good news is Mumbai, BEST has already petitioned for a price reduction, Gujarat has already given a price reduction to its people. For the full text (emphasis added by me) of the interview of Mr Piyush Goyal in the Economic Times, click here. So, why are the citizens of Karnataka being deprived of the benefits from these developments? Solar Systems Connected to the Grid - Rules? What is this MUSS Maintenance Outage?